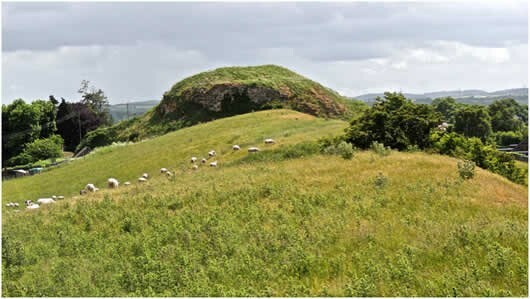 Very little remains today of Wark Castle, one of the most strategically important border castles of its time. Wark on Tweed lies about 3.5 miles south-west of the border town of Coldstream. Today it is a small, quiet village of just a few houses situated next to the River Tweed. However, Wark wasn’t always so peaceful as throughout most of the medieval period it was home to one of the most strategically important castles in the country and the scene of frequent skirmishes and sieges. The castle itself, originally built in the early 12th century, had a long and complex sequence of development, culminating in the construction of an artillery fortress during the reign of Henry VIII. Most of our knowledge today has come from historic accounts and plans and from detailed surveys undertaken in the 1990s. There is much evidence of prehistoric activity at Wark, evidenced by the cropmark site of a Neolithic mortuary enclosure, the find of a bronze age food vessel and later prehistoric enclosure sites. The latter indicates permanent settlement in the vicinity of the present village and castle, the site of which may well have been settled prior to the establishment of the Norman castle, but no evidence for occupation prior to the early 12th century has yet been found. The motte-and-bailey earthwork castle first mentioned in 1136 and apparently destroyed in 1138 must have been built of timber. It is believed to have been erected at some stage during the reign of Henry I when the barony was first established, like most of the comparable Northumbrian lordships. The castle was taken into royal hands by Henry II, following the death of Walter Espec in 1153 and rebuilt in 1158-61. The details preserved in Jordan Fantosme’s poetic account of the unsuccessful sieges of 1173 and 1174 led Bates to suggest that the castle still had timber defences at that stage. On the other hand the sum expended by Henry (£380) would imply the erection of defences at least partially in stone and that would be consistent with Henry’s work elsewhere, notably the great tower keeps at Newcastle-upon-Tyne, Scarborough, Dover and Orford. Probably the construction of at least a stone shell keep or tower on top of the motte is likely, even if the attached bailey remained enclosed by timber walls, and a stone circuit and gatetower is possible there as well. Richard I expended a further £8 on the castle in 1198-9 – presumably repairs and maintenance – but the site was handed over to Robert de Ros, a hereditary claimant, in 1200. However both Henry III and Edward I made temporary use of the castle on several occasions when actively involved in Scottish politics and warfare, before the castle and barony were again taken fully back into royal hands in 1317. This does not appear to have had any significant positive impact on the structural fabric of the castle. After briefly falling into Scottish hands in 1318 the castle was described as ‘ruined and broken’ in 1329 when the Crown relinquished control, granting it to Lord Montague. Colvin et al comment that there is no evidence any works were carried out at the king’s expense during the period from 1317 to 1329 when it was in royal hands. The supposed involvement of Wark castle in the origins of the Order of the Garter has been studied most recently by Green, from which the following summary is derived. The origins of the story, whether a myth or myth derived from obscure kernel of truth, are that Joan, Countess of Salisbury, heroically inspired her troops to defend Wark against the Scots lead by David II, and was rewarded by a banquet thrown by Edward III, at which she dropped her garter, which the king retrieved, and, observing the smirks of his courtiers, fixed it on his own leg with the famous words "Honi soit qui mal y pense" ("Evil be to him, who evil thinks"). According to Green, Jean Froissart (1337-1410), the chronicler closest to the time of the supposed event, though writing of the affection between Edward and the Countess, especially when the king supposedly raised the Scots siege of Wark in 1341, does not mention the garter incident. Froissart suggests that the Order was founded in 1344 as a revival of the knights of the round table which, he says, King Arthur established at Windsor. Collins (2000) agrees, having uncovered financial accounts that show Edward III commissioned both a round table and a huge circular building at Windsor in which to put it, although the first Garter knights did then meet there until St George's Day, 1349. As for the Garter symbol itself, Collins uncovers evidence to suggest that Edward already widely used this before the Order was founded. The first historian to mention the garter tale is the Italian Polydore Vergil (1470-1555) in his Angelica Historia (of 1534, but it seems he was only repeating something that that was already a legend in the English court of the 15th century. The first written account of the tale is found in the epic novel of chivalric endeavour Tirant Lo Blanc by the Catalan Joanot Martorell (d.1468), a courtier who was in England between March 1438 and February 1439 on diplomatic business. Martorell refers to the lady involved as "one damsel named Honeysuckle" and Vergil is coy as to the identity of the woman referring to her as "the queen or one of the ladies of the king's liking." If this was the 'Countess of Salisbury', three women have been suggested for the role. Froissart names the Countess as 'Alice', suggesting her identity as Alice Countess of Salisbury, Lincoln and Lancaster, whom Bates (1891) says was alive at the time, but aged ninety. Bates himself suggests Katherine de Grandison, herself over 30 years of age at the time, who was the wife of William, Earl of Salisbury, then a prisoner in France. John MacKay Wilson, following George Redpath's Border History (1810), suggests Joan Plantagenet, the 'Fair Maid of Kent', who was only 13 at the time, but represents the most likely candidate in view of her subsequent history. Joan was brought up in the Royal household, two of her playmates being future husbands. Whenshe was 12 she took a lover, Thomas Holland, but was forced into marrying William Montague,then aged 13. As a recompense when William and Joan became the Count and Countess of Salisbury, they took Thomas on as their household steward. Within two years, in 1346, Edward had invaded France taking William and Thomas with him. Joan, meanwhile, was on the Scottish border. In August 1347, Thomas Holland was part of the team that negotiated the French surrender and Joan arrived at Calais in time for a grand victory ball, which, Green suggests, is the most likely occasion for the incident with the garter. At the end of the war Thomas Holland succeeded in winning Joan by appeal to the Pope and they married, only for Thomas to die eleven years later. Joan, still only 32, married the Black Prince to become first Princess of Wales and the mother of the future Richard II. On St George's day 1378, wearing a scarlet mantle with blue garters, Joan was admitted as a full member of the Order of the Garter. She died in 1385. A representation of Joan appears on Wark Castle: the Countess of Salisbury leaving Wark, an illustration of Froissart’s late 14th century chronicles, produced around 1404 by Louis de Gruthuse, a Flemish nobleman. There is no reason to suppose, however, that the image of Wark castle contained therein is anything other than generic. It is concluded that the historical association of Wark with the Garter is very slim. Although the Salisbury family owned the Castle, whether the Countess defended it against the Scots, was rescued by Edward then had an association with him remains unknown. However, the story was believed sufficiently in the Victorian era for a drinking fountain to be established at Wark, which survives emblazoned with the royal arms and garter motto. Significantly it is called 'Katharine's Well', presumably after Katherine de Grandison. The turbulent history of the site in the 14th and 15th century might imply multiple structural phases relating to that period. 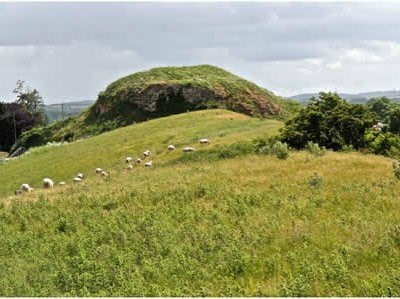 There are repeated references to the defences being slighted and its walls beaten down but stone castles were difficult to destroy completely before the widespread availability of gunpowder and some of the damage may have been less extensive than the chroniclers might imply. The overall impression, however, is that the castle was not subject to any major re-modelling after the work of Henry II. There is no record of the Crown expending substantial sums on the castle and its baronial lords in the 14th and 15th centuries had other estates with more comfortable residences, less exposed to danger, so even the domestic accommodation may have seen little upgrading. Wark must have seemed to be a liability and work may have beenrestricted to making good the damage caused in the multiple sieges and resulting from natural decay. It is uncertain how much may survive – even archaeologically – from these centuries as the works subsequently undertaken by the Crown during the 16th century were certainly very extensive and are likely to have removed a great deal of the earlier fabric of the castle..
Several main phases of building work can be identified in the 16th century. 1517-19 post-Flodden works supervised by Lord Dacre (when the castle was easily taken). The Keep was rebuilt to house artillery and over the next few years further works were carried out modifying the original design giving the keep a flat roof so artillery could be mounted upon it. In September 1523, in preparation against Scottish attack, the Earl of Surrey ordered new bulwarks and other defences with earth and timber to be erected, again presumably to support artillery pieces (two were erected, one each in the inner and outer wards). 1524-26 Further repairs by Dacre following unsuccessful two-day siege by Albany in November 1523. 1542/45/50 Construction of the ‘Ring’ around the base of the keep, transforming the motte into a raised and revetted, level platform for artillery, 24ft (c. 7.20m) wide. Also extended around the north side of the keep to command the middle ward or court, though more squared off on this side. The building of an inner wall, parallel with the south and east walls of the middle court, extending as far as the cross wall separating the outer and middle courts/wards, with the intervening space being infilled to provide a level, 20ft wide artillery platform along these sides of the middle court, similar to the Ring itself. Only the southern and a short stretch of the eastern leg were completed, the final, most northerly stretch being left as a strip of ‘lytell gardens not rampered’ The raised artillery batteries along the inner face of the north, riverside wall may have originated in this period (see 1561 plan and Sir Thomas Grey’s Survey 1568/1589). The remains of The Ring are the most substantial structural element of the castle visible today. 1592-97– Further repair works, including the north, ‘water wall’ above the Tweed. Piecemeal repairs were continued until the end of the 16th century. By 1633 what remained of the artillery had been removed, and six years later the castle was described as 'ruinated'. The ruins of the castle are steep and potentially dangerous especially in wet weather and it is suggested that it is safer to view from a distance. When viewing the castle please respect the privacy of local residents. There is a tarmac parking area in the centre of Wark Village. Take the B6350 from Cornhill-on-Tweed - 2 miles or the B6350 from Kelso - 7 miles via Spouston and Carham.